Felix holds a BM in Music Performance and BM in Music Education, and has over 9 years of teaching experience. His experience ranges from coordinating chamber music sections, formulating music for recitals and concerts to directing 30 piece orchestras. Felix has been teaching violin to students from beginner to advanced levels centering on general classroom music, the Suzuki violin program and holistic development of students through music education. 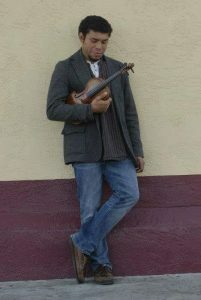 Felix is originally from Belize and is an active performing musician. His enthusiasm for music is what inspires his teaching style and his students! “Music is Life” – An Old Mentor once admonished me for playing sloppily. “You think this is a rehearsal for Music?! It’s a rehearsal for Life” Learning to think musically from a young age has helped me develop within myself, a discipline, dedication, responsibility, and respect. Every time I play we play an instrument or sing a song, we are fulfilling a deep need for our humanity while, cultivating ourselves as individuals. Come see what Music can do for You!